Worldwide consumer spending on fruit and vegetables is expected to approach the five-trillion euro mark by 2030, according to new research written by consultancy Oliver Wyman and published exclusively by Fruit Logistica, the world’s leading trade fair for the fresh fruit and vegetable business. Click here to download your free copy of Part 1 of the Fruit Logistica Trend Report 2018. 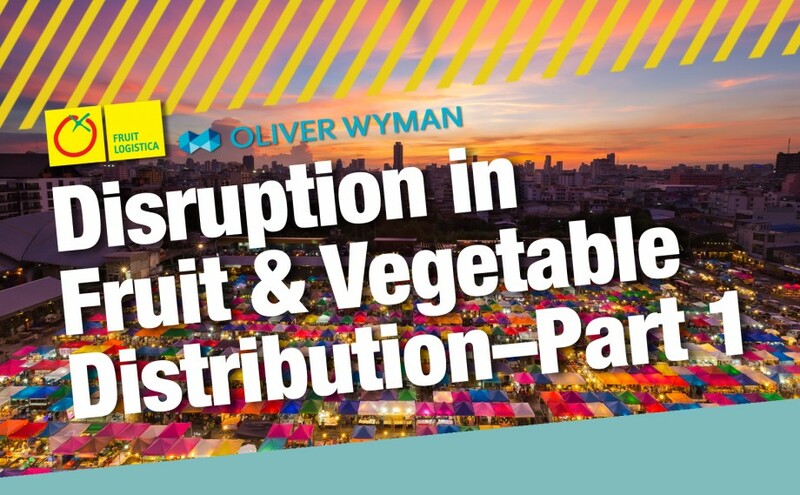 Revealed in Part 1 of the Fruit Logistica Trend Report 2018 – Disruption in Fruit & Vegetable Distribution, that figure represents more than double the €2.1tn sales recorded in 2015. What’s more, markets in the Asia-Pacific regoin are expected to account for over half (56 per cent) of those global fresh produce sales by 2030, more than the rest of the world combined. As the marketplace for fresh fruit and vegetables becomes increasingly globalised and interconnected, the way those products are carried from origin to market is changing, in many cases dramatically. The drive towards greater efficiency, for example – often through the use of new technologies such as blockchain – is helping companies to improve, expand and consolidate. Part 1 of the Fruit Logistica Trend Report 2018, which has now been published in full on the Fruit Logistica website following its recent unveiling at Fruitnet World of Fresh Ideas, explains how this evolution will influence companies in the fruit and vegetable business during years to come. It also looks closely at when and where in the world those factors will have the biggest impact, taking into consideration major geographic trends as well as the time, manner and place in which people will choose to consume fresh fruit and vegetables. To read more about future trends in fruit and vegetable markets, as well as how the fresh produce supply chain is being re-shaped as a result of those trends, download your free copy of the Fruit Logistica Trend Report 2018 here. 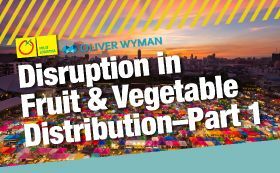 Figures cited are published and analysed by Oliver Wyman on behalf of Fruit Logistica, and sourced from Passport Euromonitor. Part 1 of the Fruit Logistica Trend Report 2018 is available here. Further chapters will be published on the Fruit Logistica website over the coming months.